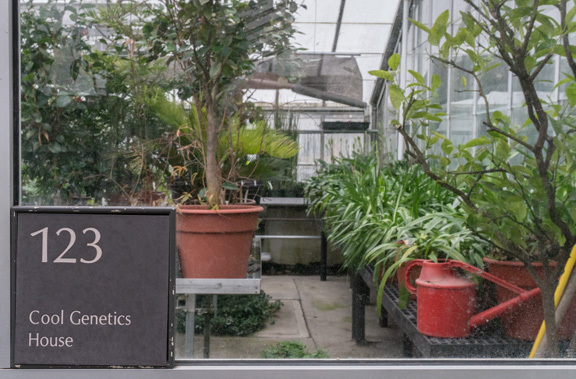 Albert F. Blakeslee and Sophie Satin, both eminent geneticists, conducted botanical research at Smith College. Blakeslee came to Smith in 1942 after a long and distinguished career at the Carnegie Station for Experimental Evolution at Cold Springs Harbor on Long Island from which he was exiled by the mandatory retirement regulations then in place. Sophie Satin, his long-time research associate, was doubly exiled; she had been born in Czarist Russia and her family were members of the minor aristocracy. Sergei Rachmaninoff, the pianist and composer, was her first cousin; like Rachmaninoff, she left Russia after the Revolution. She had learned of Blakeslee’s work at Moscow University; on arriving in the United States, she visited him at Cold Springs Harbor and soon joined his working group. Their association would last until his death in 1954. Blakeslee's first appointment at Smith was a one year position as the Neilson Professor of Botany; he stayed for the rest of his life, founding the Smith College Genetics Experiment Station in a few rooms in Burton Hall, a small range of greenhouses near the Lyman Plant House, and sheds and other greenhouses on scattered plots. At its peak his research group included, in addition to Sophie Satin and various professional staff, visiting scientists from America and abroad, Smith College undergraduates, and graduate students seeking M.A. and Ph.D. degrees. Professor Burk’s talk will focus on Sophie Satin’s early life in Russia, the nature of Blakeslee’s work at Smith, and Sophie Satin’s surprisingly productive life after her time in Northampton. C. John Burk is Elsie Damon Simonds Professor Emeritus in the Biological Sciences Department at Smith College. Burk came to Northampton as an instructor in the Botany Department at Smith College in September 1961, teaching courses in plant ecology and systematics, biogeography and conservation of natural resources. His research interests center on the floras and ecology of wetlands and coastal areas, as well as botanical history, including the history of botanic gardens and illustration. Retired from teaching in 2009, he remains active in research. Historic Northampton is pleased to announce a new lecture series, From Mars to Molecules: Quirky Scientists who put the Valley on the Map. The Valley has long been home to remarkable scientists. This spring we highlight several who were also unusual characters. Subsequent lectures in the series this spring will be held on the first Saturdays of the month at 2 pm.